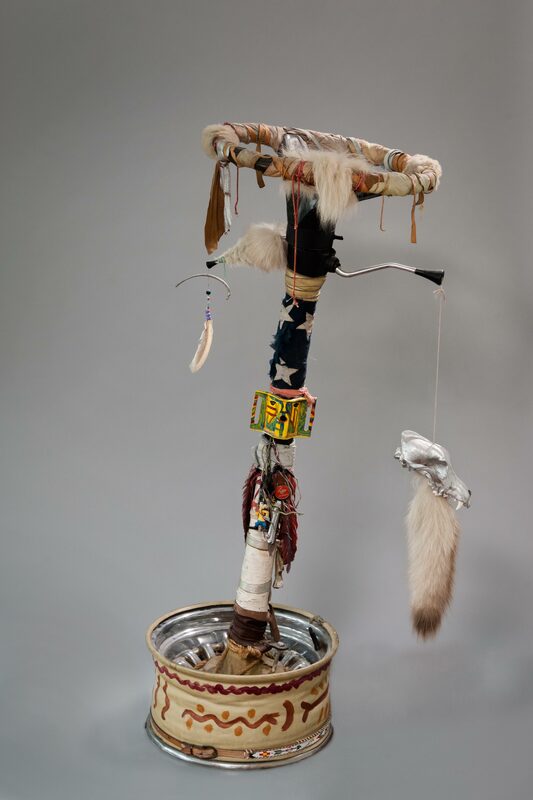 Purposefully using materials that act as stereotypical signifiers of "authentic" Native American art, Jimmie Durham incorporates beads, feathers, fur, and leather into this composition. As a writer and artist whose work explores how objects reflect the knowledge and values of a culture, Durham embraces narrative and often includes text in his pieces. The fictional character José Bedia is an archaeologist in the future. Durham paints him as an earnest explorer, all the better to parody his unintentional misinterpretations of his "discoveries." In making Bedia's adventures imminent, Durham is able to borrow the language of science fiction, taking a critical position in relation to the past but also to the present, suggesting that questionable ethnographic practices continue unchecked. "Bedia's Stirring Wheel." Take It or Leave It: Institution, Image, Ideology Digital Archive. Los Angeles: Hammer Museum, 2017. https://​hammer.ucla.edu/​take-it-or-leave-it/​art/​bedias-stirring-wheel/​.